In a world where magic is commonplace, Abby has no magical abilities. In short, Abby is an ‘Ord’, something to be despised. Unlike other families however, Abby’s family keep her as they love her rather than give her up to treasure-hunting kidnappers. As Abby is unaffected by magical spells, wards and enchantments, she is the perfect tool to steal treasure. Thus the story follows Abby as she settles into a school for Ords, learns how to live as an Ord and tries to escape the clutches of numerous nemeses. 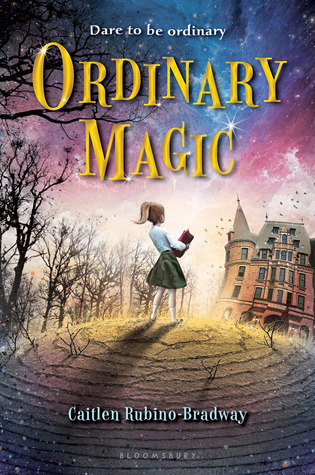 I enjoyed reading Ordinary Magic by Caitlen Rubino-Bradway to a certain extent. It was a light, quick read aimed at middle-grade readers. It puts a unique twist on magic, as the main character isn’t magical at all but lives in a world full of magic. I was excited to see what Abby would learn at the Ord school and how she would come to terms with not having magic. Unfortunately, the lessons were just the usual ones like Literature and Maths as well as an added self-defence class, so that the Ords would have a fighting chance against would-be kidnappers. The lessons are more shown in passing rather than being crucial to the story as I would have liked. Also, Abby doesn’t know how to wash dishes or mop a floor as this all used to be done my magic at home, so at the Ord school, these are some of the things she learns. I was puzzled by why Cook Bella was mean to Abby at first and why Abby continued to wash dishes throughout the whole year as if it held an allure for her. What really stood out for me was Abby’s funny family. They were such a close-knit bunch who liked to aggravate each other but who clearly loved each other. Abby was really lucky to have such a loving family because some of her friends weren’t in contact with their families after discovering they were Ords. The main dilemma comes in the form of Barbarian Mike and Trixie; treasure-hunters who need an Ord for their unscrupulous activities. They would go to any lengths to catch an Ord and Abby has caught their attention. I liked these villains. Mike and Trixie are suitably evil for the age group that Ordinary Magic is aimed at. Ordinary Magic fell short of my expectations. I wanted Abby to learn more rather than just self-defence. Also, I would have enjoyed more emotional depth. 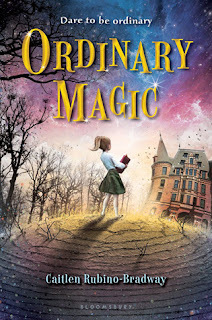 Overall, Ordinary Magic was a fun read that puts a twist on the usual magic stories and would appeal to younger readers.